In this Photoshop Effects tutorial, we're going to look at how to invert the colors in an image to create interesting photo effects. Most people would agree that taking a stroll through the forest can be very calming and peaceful, with all of its natural green and brown colors. But who says forests have to be green and brown? Certainly no one with a copy of Photoshop. We can have any colors we want in our images, and in this tutorial, we'll see how easy it is to flip nature upside down and invert its colors, creating a strange, even mystical appearance. The final "inverted colors" effect. Select the Lasso Tool from the Tools palette. 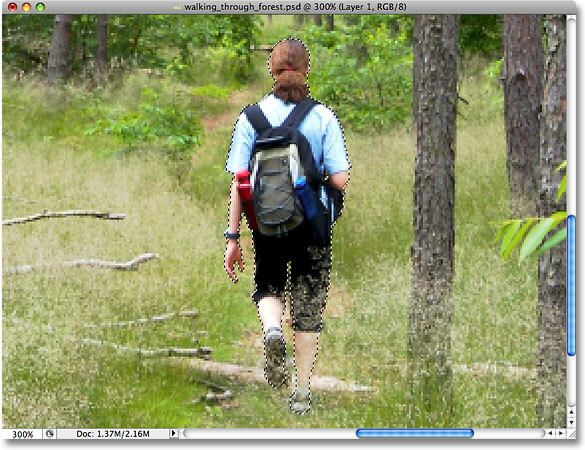 A selection outline appears around the person in the photo after drawing a selection with the Lasso Tool. 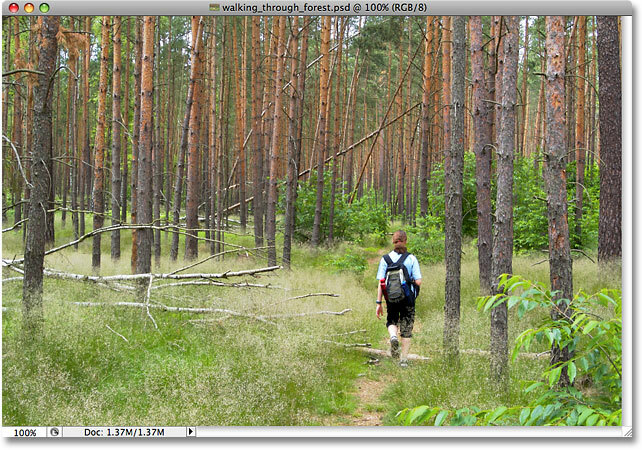 The selected area has been copied to its own layer above the Background layer. Click on the Background layer to select it. The colors in the image are now inverted. 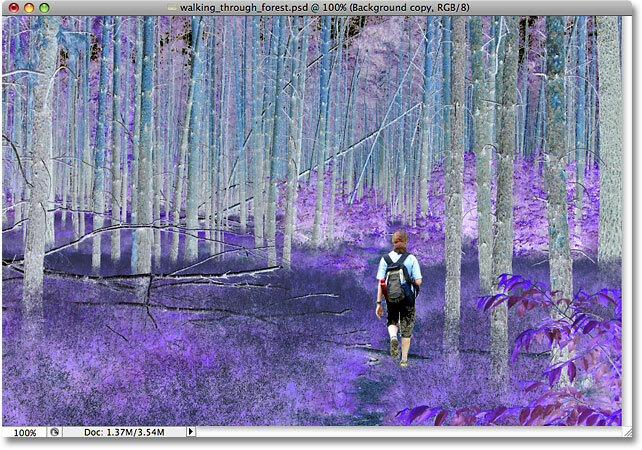 Step 4: Change The Blend Mode Of The Inverted Layer To "Color"
Changing the blend mode of the inverted layer to Color. Changing the blend mode to Color brings back the original brightness values. The basic effect is now complete, but I'm going to add a bit more of a mystical look to the image to finish it off. To merge all visible layers while keeping the separate layers intact, hold down Alt (Win) /Option (Mac) while selecting the Merge Visible command. The layers have been merged on to a new layer above the copy of the Background layer. Changing the blend mode of the merged layer to Overlay. The Overlay blend mode has boosted contrast in the forest. 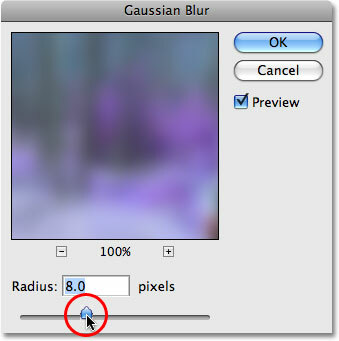 Adjust the amount of blurring with the slider at the bottom of the dialog box. I'll click OK to exit out of the Gaussian Blur dialog box, and we're done! If you find that the blurring effect is too intense, an easy way to reduce it is to simply go up to the Opacity setting at the top of the Layers palette (directly across from the Blend Mode option) and lower the opacity to fine-tune the effect. In my case, since I'm going for more of a mystical look, I'm happy with the results so I'll leave my opacity setting at it's default 100%. And there we have it! That's how to create an inverted colors photo effect with Photoshop! Visit our Photo Effects section for more Photoshop effects tutorials!